Insects, rich in protein and highly sustainable, could be the future of food. According to the United Nations, approximately two billion people across the globe practice entomophagy – the consumption of insects as food. While many Westerners struggle with the idea of introducing bugs to their diet, it appears that attitudes are changing. Cambodia is the center of cricket cuisine culture, and for a good reason. Under Khmer Rouge control in the 1970s, Cambodians faced genocide and famine due to the communist regime’s agricultural reforms. Many began eating crickets to avoid starvation. Thun Mong is a cattle farmer turned cricket farmer who grew up under the ultra-Maoist regime. He uses a combination of black lights, plastic sheeting and bamboo to lure crickets into water-filled holes that he digs around his farm. Mong says that a good night can yield 30 kilograms of the chirping insects – which he can sell to a middleman for about a dollar per kilogram. Two French expats living in Cambodia, Gerard Thevenet and Philippe Lenain, see the cricket’s potential as a sustainable source of protein. Though they didn’t intend for their insect snacks to be a hit with Western tourists, Thevenet and Lenain prepare the unappetizing insect in a way that suits Western palates. The pair’s company, Khmer Iron Cricket, sells four different flavors of cricket cookies, as well as offering rehydrated crickets that are baked for 14 hours with a special blend of garlic and spices. The creepy crawly treats are packaged in attractive boxes with transparent tops, emblazoned with the Khmer Iron Cricket slogan – Powerfully Delicious! But the duo also has an ulterior motive: eradicating malnourishment among Cambodian children. Thanks to their high sustainability, crickets and other insects could be the answer to a future food crisis. 100 grams of cricket powder contains 69 percent protein – the same amount of dried beef contains only 45 percent. Crickets require 12 times less feed than cattle and a fraction of the water – agriculture and livestock production has taken over 40 percent of the Earth’s land and uses 70 percent of the planet’s freshwater. Crickets also produce 80 times less methane than cows, and when ground into a powder, crickets can provide nearly as much calcium as cow’s milk. In September, a “Future Food Salon” in New York City promoted insects as food. The event offered everything from cricket kebabs to cricket chocolate. A popular Mexican restaurant in the city’s SoHo neighborhood is struggling to meet demand for a cricket burger – selling up to 100 a day. A pop-up “Pestaurant” in London attracted curious passerby with barbecued tarantulas and sun-dried caterpillars – but a mealworm-topped pigeon burger appeared to steal the show. Aside from the health and environmental benefits, there is karmic incentive for eating bugs: There is evidence that suggests insects don’t feel pain. 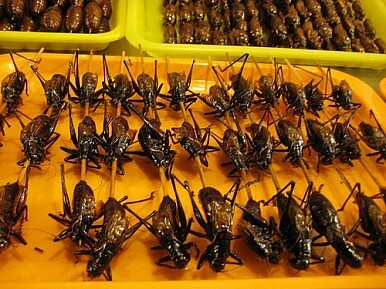 From being eaten out of desperation to their recent culinary rise in the West, crickets may someday make mouths water.